Over the weekend, Dreamhack Winter went down. 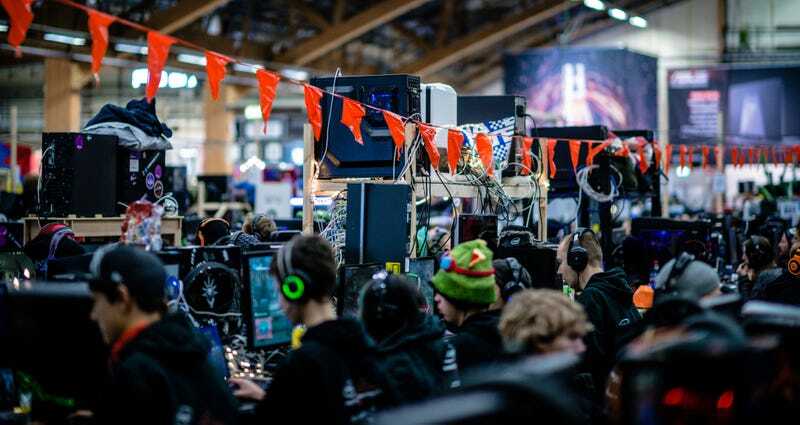 Beginning in 1994 with a couple of Swedish dudes who rented out a school hall to play some video games, it's now the world's biggest LAN party, bringing over 25,000 PC gamers together in the one spot for some games, music, cosplay and sweating. Last year, the official numbers recorded 17,618 unique devices (ie, computers) coming to the party. This year that figure was smashed, with 22,483 devices being registered, and a grand total of 26,672 visitors, up almost 2000 from 2013. Alongside the more casual gaming and parties, the weekend featured a number of big esports events, for everything from Counter-Strike to StarCraft to DOTA (and even Hearthstone). These images were taken for the official Dreamhack account by photographer Gabriel Kulig. You can see more here.